One-time Hoops defender Jean-Joel Perrier Doumbe played a part in Olivier Kapo's switch to the SPL club. Olivier Kapo has revealed one-time Celtic defender Jean-Joel Perrier Doumbe convinced him to sign for the club. The former French international, who also stated his desire to be a Celtic player for “as long as possible”, claimed Doumbe is “like a brother to him” and had sold him on a move to Scotland. Kapo and Doumbe spent 11 years together at French club Auxerre earlier in their careers, both leaving to sign for Juventus and Stade Rennais respectively in 2004. Doumbe then went on to spend two years at Celtic from 2007 to 2009, playing just seven times but scoring the winner in the 2007 Scottish Cup final against Dunfermline Athletic. 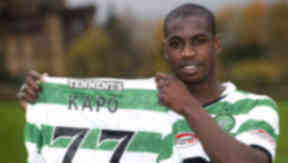 His time with the Hoops however was memorable enough for him to recommend Kapo to join Neil Lennon’s team, with the winger signing a contract until June 2012. It has been widely reported that Kapo, who will wear number 77 for his new club after completing his free transfer move, would have an early termination clause inserted in his deal. However, the 30-year-old claims his deal will run until June 2012, with no exercisable option for the Parkhead club to cancel his contract in January. Having left Wigan Athletic before the close of the summer transfer window, Kapo is free to play immediately for Celtic. However, he last played competitive football for French club Boulogne, where he was on loan at the end of last season, back in May. Kapo has been training with his former boss Steve Bruce at Sunderland of late, reuniting with the man who originally took him to England from Juventus to Birmingham City, and then moved him to Wigan Athletic when he took over the reins at the DW Stadium. The left winger, who was born in the Ivory Coast, has played nine times for France, with his last appearance coming in a 2004 friendly against Brazil. He was also involved in their Confederations Cup win in 2003, scoring the opening goal in a 5-0 group stage win over New Zealand. Kapo also scored in friendlies against Egypt and Serbia and Montenegro.